So this week I officially started drafting a new MG (although I made a last minute switch from the contemporary I was considering to a fantasy). I’ve done a lot of drafting recently, and by the end of the first day, I noticed I was already falling back into my less-than-healthy patterns. See, I like to draft quickly. Like, get the whole first draft done in about a month, quickly. Which doesn’t leave a lot of time for distractions. I’ve gotten pretty good about limiting my social media time while writing, and perhaps too good at limiting everything else. I wear a fitness tracker to count my steps, and while my goal is 10,000 steps a day, my average on a work day sits closer to 8,000. On a day when I’m drafting, it’s more like 4,500 – about the distance to take my kids to school and back, plus however many steps it takes to make dinner. Which really isn’t healthy. Thanks to my concussion, walking is about the only exercise I’m allowed to do (everything else sets off migraines), so it’s important I keep up the pace. Plus I tend to get my best ideas while I’m walking, and fresh air and computer breaks are good headache busters. So I’ve started trying to add in a walk in the woods near my house in the morning before I start writing for the day. It doesn’t set me back, time-wise, too much, and it helps with inspiration because my MG is set in a magic forest. Even better, it gives me a chance to indulge in my hobby of photography. My goal is still to get this draft finished by the end of May, but to do it without sacrificing my health. What about you? How do you balance work with health? Let me know in the comments. FUN WITH FROSTING Turns 1! It’s hard to believe, but Fun with Frosting has been out for a whole year now! Thanks to that book, I’ve done two signings (not counting my book launch), two TV appearances, and baked more cakes than I can count. It’s been an exciting, fun, and delicious year. Over the last year, I think the question I’ve heard the most is: How’s the book doing? And it’s a tricky one to answer. When the book first came out, I checked my Amazon rankings (Canadian and American) obsessively – but all that tells me is how the book is selling compared to all the other books at that moment in time. Not that that’s a bad thing. You can bet I celebrated the hour or so I had the #1 book in Cookbooks > Baking > Cakes in Canada. I won’t lie, seeing it hit that rank was awesome. But it was also the peak. And no amount of obsessive rank-checking was going to help my sales, so I had to stop and focus my energy on more productive things, like writing. But I also haven’t been promoting it as much as I could have, so consider this my promo post. 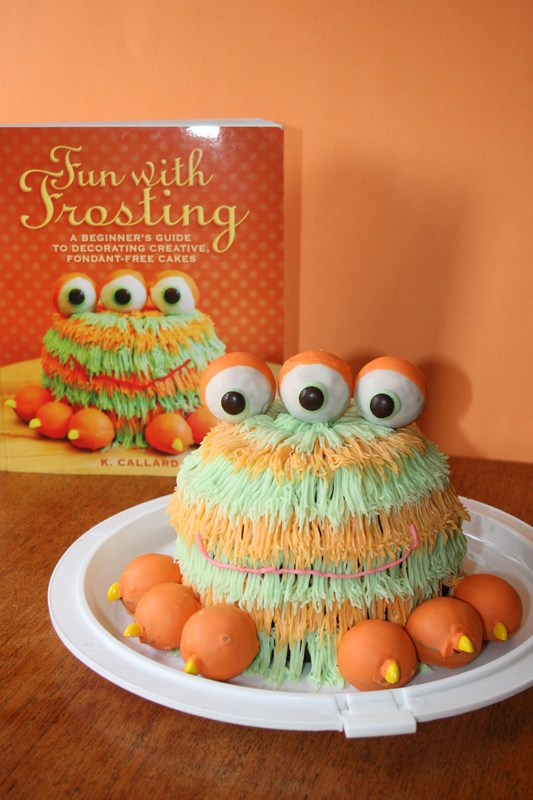 For those of you who don’t know, Fun with Frosting: A Beginner’s Guide to Creative, Fondant-Free Cakes is an instructional book for beginner bakers of all ages, covering the basics of baking, assembling, and decorating, as well as step-by-step instructions for 40 fun, kid-friendly designs. It is available at Amazon (US), Amazon.ca, Chapters, B&N, and via Indiebound. And if you buy a copy in the next month (before May 19/17) and send me proof + your address via the handy little Contact Me form on this site, I’ll mail out a signed bookplate as a special Bookaversary gift to you. Of course, that means it’s time to go back to one of my less favourite parts of writing: drafting. It’s slow, it’s messy, the characters don’t always do what you want them to do (even with an outline), and drafts don’t sound anywhere near as nice as finished books, so it’s really easy to get discouraged. I’ve had a lot of trouble with drafting over the last few months. I’ve written a full YA, and more than 20,000 words in three separate MG attempts – none of which will ever likely make it beyond my computer. Each of those drafts has had glaring problems – problems I’ve been able to identify, but not fix. Until then, it’s back to the drawing board. Looks like I’m going for attempt #4 at an MG, a contemporary this time (since my YA Contemporary is still so fresh in my mind). I still have some more outlining to do, but I hope to have it written by the end of May (depending, of course, on any other revisions that come in and take precedence). Moreover, I plan to finish this draft, all the way through to the end, and hope that I can fix any glaring problems in revision. I know some people absolutely hate the editing stage, but for me, it’s where the magic happens. The drafting stage is always full of doubts. Is this any good? Why is this character doing this? How am I going to finish this? What happened to the monkey? But by the time I get to the editing stage, I’ve put those doubts behind me. I’ve decided my story is strong enough that it’s worth fixing. Once I get the input of my critique partners, every edit just makes the story even better. But the best part comes after I send my shiniest version to my agent Bri. Her comments are invariably so concise, so accurate, that my mind is racing with solutions before I even finish reading her editorial letter. In case you can’t tell, I’ve been hard at work on edits for Bri for my YA Contemporary. With any luck, I’ll be on sub with it soon, and then go back to two of my less-favourite aspects of writing: drafting (more on that next week) and waiting. Are you a writer? What are your favourite parts of the process? Let me know in the comments.